Earwigs eat an omnivorous diet of other insects and plants. This diet can be beneficial: earwigs feed on aphids, mites, fleas, and insect eggs. Unfortunately, in gardens they munch on dahlias, marigolds, lettuce, potatoes, and hostas. They will also feed on mosses, lichens, and algae. They feed at night so during the day you will only see the damage on the plants. Often by investigating around the area in moist damp locations will reveal them hiding especially underneath debris, watering cans and hoses, rocks and thick mulch. Three types of control methods are used to manage earwigs in the home or landscape: sanitation, mechanical means and chemical control methods. 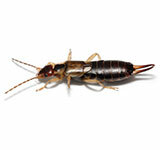 Mechanical methods: If only an occasional earwig is found indoors, remove it with a broom, dustpan or vacuum. If you often encounter earwigs indoors, inspect the area to determine how they are entering the structure, and seal up cracks and entry points. Use caulking and weather-stripping around doors, windows, pipes and other places to exclude insects. Because earwigs generally enter the home at the ground level, pay particular attention to low areas. Trapping can also be used to reduce populations outside the home. Traps such as rolled-up newspaper, corrugated cardboard, bamboo tube or a short piece of hose should be placed on the soil near plants or other sites suspected of hiding earwigs. Check the traps the next morning and shake out any accumulated earwigs into a pail of soapy water. Continue trapping until earwigs are no longer being caught. Chemical control: Earwigs are easily killed by residual insecticide treatments. Focus your chemical control efforts on the outdoors because that is where the problem originates. Use insecticides outdoors in a 3- to 5-foot band around the structure next to the foundation (perimeter treatment) to stop or limit earwigs from getting indoors. Areas to treat should include flower beds and sub-floor crawl spaces. Although sprays and granules are effective, you need to wash them into the soil with water, as earwigs can move far into the ground. Using chemicals indoors will not solve the problem of earwigs entering the building and should be used only as a supplement to outdoor efforts.